Happy Tuesday everybody! It's has been quite dreary over the past few days if you ask me, but luckily things have dried out a bit so far today (this could change later tonight though stay tuned). Right now, we are waiting on a nice cold front to pass through the area that has taken its' sweet time getting to us. This front will help to push out all of this rain and usher in more fall-like temperatures by the end of the week. I'm certainly ready for some more fall weather. We've seen a lot of rain over the past few days and some of you may be wondering how much more we will see. Well, it depends where you are across the Mid-South region. 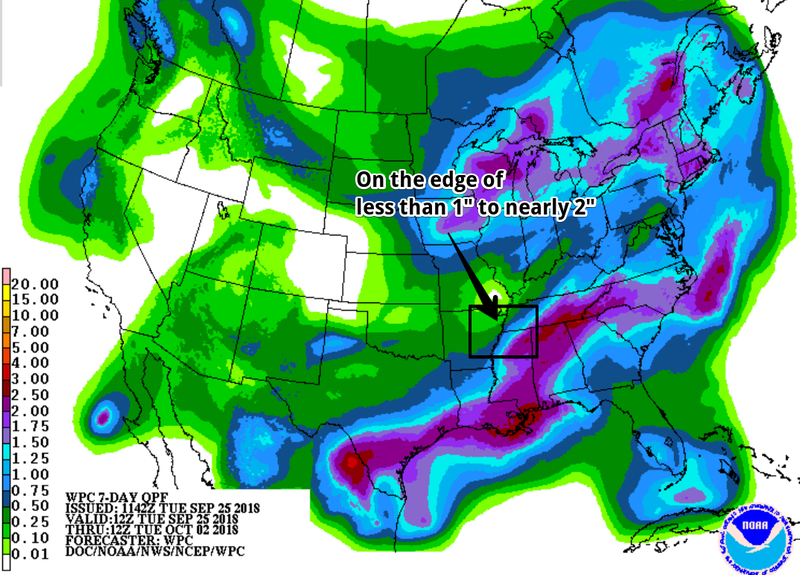 The Memphis area is right on the bubble of getting not a whole lot to getting a pretty good bit of rain over the next week. The majority of this will fall between today, tomorrow, and then the beginning of next week. There is a break from all of this rain coming folks and it will be nice when it gets here. Our afternoon break from the rain is soon to be forgotten as more scattered showers and maybe even a thunderstorm or two are suppose to move through this evening into the overnight hours. I am still optimistic that the afternoon will stay relatively dry, though outdoor fields will likely still be muddy from yesterday and this morning's rain. Scattered showers should begin to arrive around to a little after dinnertime this evening. Temps will cool to near 70 overnight. Tomorrow morning's commute may be a little soggy as scattered showers will be pushing through the area right around rush hour. We could see a few heavy downpours as these showers push through. Showers and isolated thunderstorms will hang around into the early afternoon hours tomorrow. Things should clear out by the late afternoon for any sports practices, but once again fields will likely still be fairly wet from the rain earlier in the day. Clouds throughout the day along with these showers will help to keep temps in the 70s throughout the day. You may notice that our temps will be much cooler tomorrow than today. Well, we've got some good news for you. As tomorrow's showers are moving through, so will a cold front that will bring cooler temps to the area for the remainder of the week. WPC's front and weather type graphic highlights the change for showers tomorrow as the much-await cold front pushed through the Mid-South. This cold front will push through entirely by Wednesday evening, so temps will get much cooler overnight with lows in the low-60s tomorrow night. While this isn't too cold, it is much cooler than we have seen in recent times, so you may need to pull out some fuzzy socks to walk around in if you are into that sort of thing. Hello semi fall-like weather! It will finally arrive Thursday folks. We will have some lingering clouds on Thursday, but skies will clear out by Friday to make way for plenty of sunshine heading into the weekend. Highs will be in the mid 70s on Thursday with highs near the upper 70s on Friday. Overnight lows will be in the low to mid 60s. Saturday appears to be the "better" day of the two this weekend with sunny skies and highs near 80. Northerly winds will remain which will help to keep that muggy feeling out. Unfortunately into Sunday winds will begin to shift more eastward and eventually southerly. This wind shift will allow dew point temps to begin climbing back up, bringing that somewhat sticky feeling back into the Memphis area. Temps will begin to warm Sunday as well with highs nearing the mid 80s under a partly sunny sky. Our cooler temperatures could only last so long as warmer temps in the 80s are expected to return next week. The Climate Prediction Center (CPC) has the Mid-South included in the above average temperatures category and slightly above average precipitation for next week.